I might as well go ahead and get a second helping of humility. 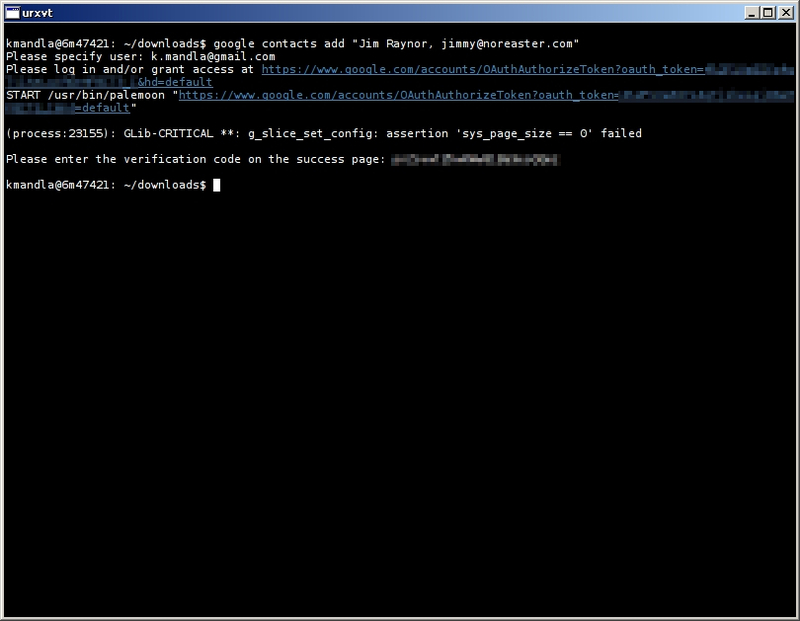 After royally fumbling klick, I need a second smack in the head to acknowledge my error with gist. Yes, I’m afraid I can’t just pretend I didn’t flub this one too. The real tragedy is, when compared to other pastebin tools I’ve seen in the past two years — like elmer or uppity or some others — gist is one of the better ones. Some of gist’s cooler functions that I’ve noticed: automatic URL shortening through git.io, direct hookups with both xclip and xsel, updating existing gists with just the address hash, and one-time account authorization with the --login flag. Nifty. One thing I’ve seen other tools do that I don’t see offhand in gist: Access to several different hosts. But I suppose that’s the nature of the tool, and what’s available through Github Gist. At this point, with the landscape of pastebin tools largely dependent on what site they can access, I imagine the choice of tools might shift to what services the target site offers. For that reason it might make sense that gist wins fans among programmers. Just from the upload page you see in the screenshot, you can fork an uploaded snippet, watch revisions and clone it off the page. I can see the appeal among coders; someone’s random list of words quickly becomes the next killer app. This entry was posted in Linux and tagged code, paste, pastebin, text, upload on 2014/11/06 by K.Mandla. My office uses Google Documents for almost everything it does. We all have GMail addresses and even our primary site is managed through Google, although the intricacies escape me. I concede that it does streamline some things, but only because I have to. I’m still no fan of the cloud, and I never have been, and probably never will be. That’s the same example that appears on the home page, so I suppose pixellating much of those images was unnecessary. All the same, I think you should get the point. With something as simple as google contacts add and a little data, I get a corresponding addition to my online Contacts list. Which is what you would probably expect. And it likewise goes without saying that googlecl can handle not only GMail Contacts, but also Blogger posts, YouTube uploads, Calendar events, additions and edits to Documents, and just about every other aspect of your collective Goo-perience, from the command line. I can’t go into too much detail on invididual commands and configuration, mostly because each Google aspect has its own rasher of options and specifics. If you’re genuinely interested — and again, for my daily workload I already see a few places this can be useful — you’ll need to look closely on your own. Probably the one thing I like best about googlecl is what you see in the terminal screenshot above: Rather than require a configuration file setup, googlecl simply links you to the API authentication page, and prompts you for the passcode. It does save a step, and gets you moving a little faster with the entire Goo-perience. This entry was posted in Uncategorized and tagged data, download, management, upload on 2014/09/06 by K.Mandla. You might remember wget from last week — the omnipresent hyperflexible download tool that doubles (and triples) as a site crawler, mirror utility and download manager. What would be great is if there was an opposite tool, one that followed much of the same structure and flag options as wget, but — wrap your head around this one — uploaded things, instead of downloading them! Well, believe it or not, such a tool exists. And as luck would have it, it’s named … wput! -V, --version         Display the version of wput and exit. No screenshot this time, because no matter how clever or convenient wput is, I would still need a destination for my upload example. And as far as I know, there aren’t many sites that offer free, anonymous, one-time FTP uploads. What’s that about?! No matter. 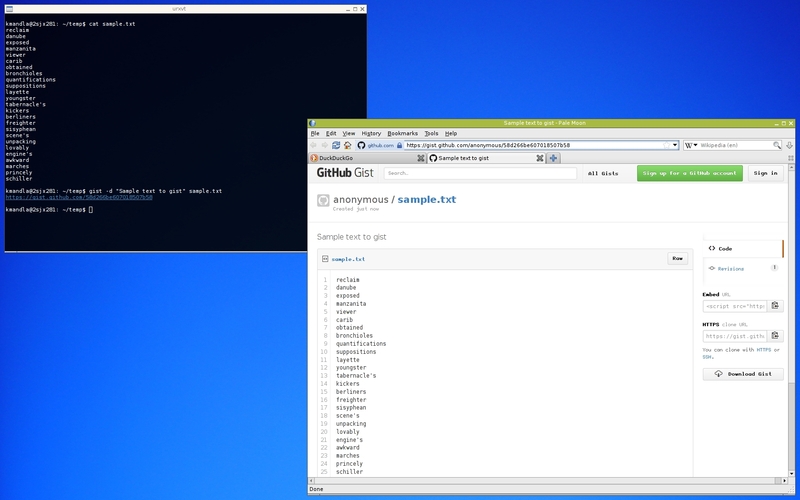 If you’re used to the style and arrangement of wget, you’ll appreciate that some of the controls are similar. The -q, -v, and -a flags carry the same meaning to wput as wget, and I see a few more that look the same. Of course, a lot of them are also different, which can’t be avoided. For example, the -nc flag in wget, which stood for “no-clobber” and prevented re-downloading and overwriting files that appeared locally, is instead “no-continue” for wput … as in, don’t resume a partially uploaded file. Like I said, there’s no way around some of those. But if you’re accustomed to wget’s way of doing things, wput might feel natural. This entry was posted in Linux and tagged ftp, manager, upload on 2014/07/02 by K.Mandla. I have a link to the home page for wgetpaste, but it gives me nothing but a 404. Perhaps it has moved. wgetpaste uploads text to pastebin-ish services, much like curlpaste or elmer or others. Judging by the -S flag, wgetpaste supports about five or six upload hosts, but I’ll be honest and admit I didn’t try all of them. But as you can see, a quick default run through wgetpaste sent my test file out into the wild blue yonder, and it arrived safely and intact at bpaste.net, the default host. There are a couple of other options worth mentioning. wgetpaste can use tee to show you what it’s sending out. It can also interface with the X clipboard, like uppity does. And it has an option to send a URL to tinyurl.com, kind of like surl does. So I suppose, if you wanted some of the functions of other tools, or features of other text-paste tools, wgetpaste might be a good choice. This entry was posted in Linux and tagged code, manager, network, paste, pastebin, text, upload on 2014/06/28 by K.Mandla. Just by virtue of alphabetical order, uppity is arriving near the end of a long list of pastebin-ish upload tools. I’ll try to give it the same measure of attention that its competitors received, even if I am beginning to wonder why there are so many of these tools, and if there is a requirement somewhere for CS majors to write a program to upload a code snippet to the Internet. uppity, in conjunction with dpaste.com, worked fine for me, and I was able to apply a description to the short text file I uploaded. uppity supports quite a few different services, and there’s always the chance that it will fall out of favor with one or more of them. But uppity cleared the first hurdle — do what you promise — without incident. The variety of features available between services is probably what accounts for some of uppity’s options; there are specific flags for language (code language, not spoken language 😉 ), expiration, description and nickname, to name the majority. It will also mash together separate files into one whopping upload, if you ask nicely. 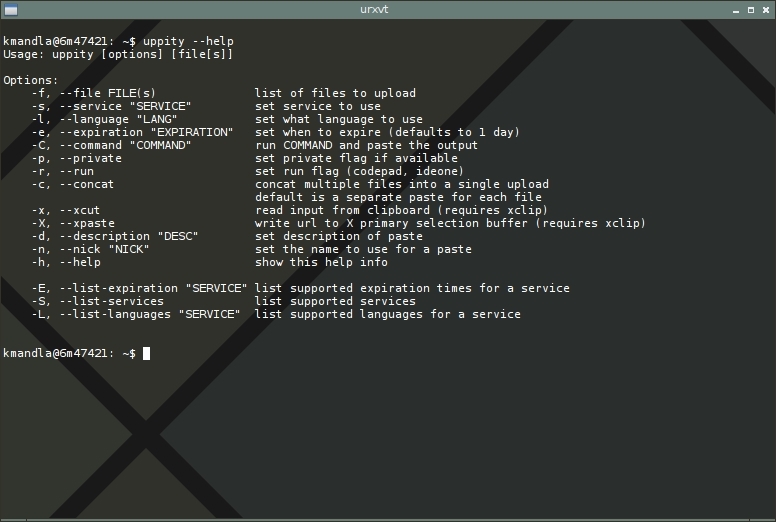 uppity also makes a point of listing the languages supported for each service with the -L flag, so if you’re looking for one that will enhance a specific block of code, that might be useful to you. And I also see, but didn’t test, features specific to a graphical environment, to including reading from the X clipboard and writing to X’s primary selection buffer, both of which need xclip installed to make use of. The beauty in that, as I see it, is uploading your code snippet, then immediately pasting the link from the selection buffer, without the added step of opening a browser or highlighting the displayed text. I like uppity for doing the job and having the forethought to add a few time-saving shortcuts. As it is, I rarely need a pastebin-ish service, but when the time comes I’ll make a point of hunting down uppity again, and giving it the chance to impress again. This entry was posted in Linux and tagged code, manager, network, paste, pastebin, text, upload on 2014/06/17 by K.Mandla. I realize now, well after digging deep into the T section, that I should have broken apart a lot of the programs listed here and clumped them together in megaposts, like I did with 2048.c. Recording what happens in the terminal is not new. If you remember script, the granddaddy of terminal recorders, you’ll know that this idea has been around for decades, and there’s nothing new in piping the output of your terminal screen (emulated or not) into a recorded session. The novelty comes in the variety of tools that will do it for you. I intentionally skipped over one of these programs — termrec — a week or two ago. I’ll take care of that one today, and I also have nh_recorder, ttyrec, ttygif and tty2gif, plus a bonus at the end and an online solution to mention. For each one I’ll try to give a quick rundown on the high points and low points, and my overall impression. Pros: Very light, very transparent. Could be good for extreme cases where nothing else seems to function, or over specific network connections. Cons: Only dumps to a file; needs its counterpart, nh_player, to replay. No practical control outside editing the code. Seems to only update a line at a time. I.e, no real animation effects, only periodic line-by-line refreshes. Overall: This might be just a primitive tool intended for use with old versions of NetHack. It works, even if it’s not really practical. Pros: Supports remote sessions. Can start an application directly, instead of spawning a subshell (a la script). Can append existing recordings. Has playback and timer tools. Cons: Clips the terminal size, which means you may end up with large empty areas if you record ncurses applications. Only sends output to its own format. No compression options. Overall: This is a step up from nh_recorder, but it’s frightening that it slices away at the terminal area and leaves large black swaths where your application should be. I hope that was something I did wrong. Regardless, it lacks some of the features that the upcoming applications have. Pros: Converts ttyrec format files into animated gifs, by playing back ttyrec files and using imagemagick‘s import command on them. Cons: Somewhat haphazard in its delivery. Two-step process; ttygif makes a slew of specifically named images, then relies on an included shell script to concatenate them. Final product should be a recording of the terminal session, in gif format. Relies on imagemagick. Overall: Just too spattered for my liking. 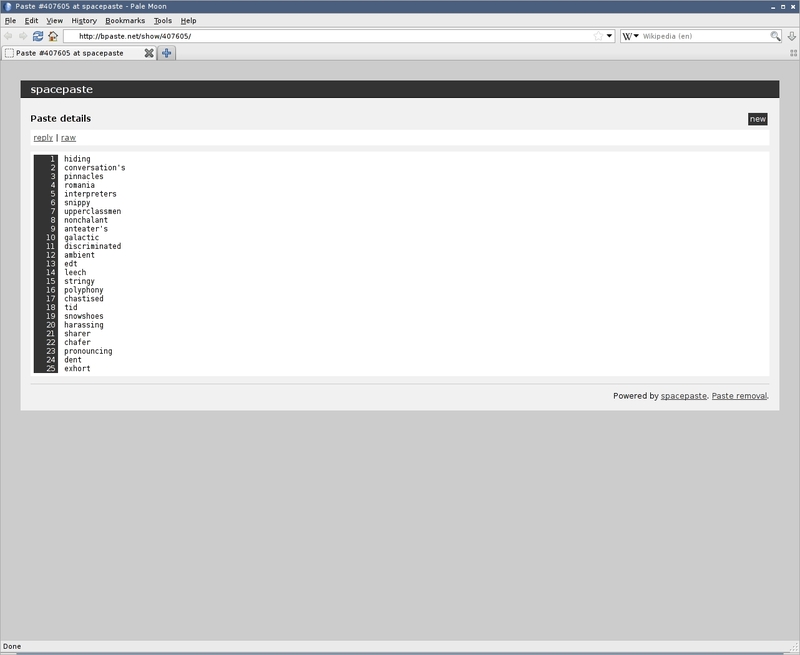 Even short recordings create a mess in your directory. The only time I can see where this would be a good approach is if I needed to edit out specific frames of a recording, and even then it would be a chore. Conceivably this could allow some control over frame quality and delay though. Pros: Automatic compression. Support for ncurses applications. Compatible with ttyrec. Option to append recordings. Will save in several formats. Can jump straight into an application, instead of spawning an additonal shell. Cons: Some screen corruption in playback of ncurses applications. 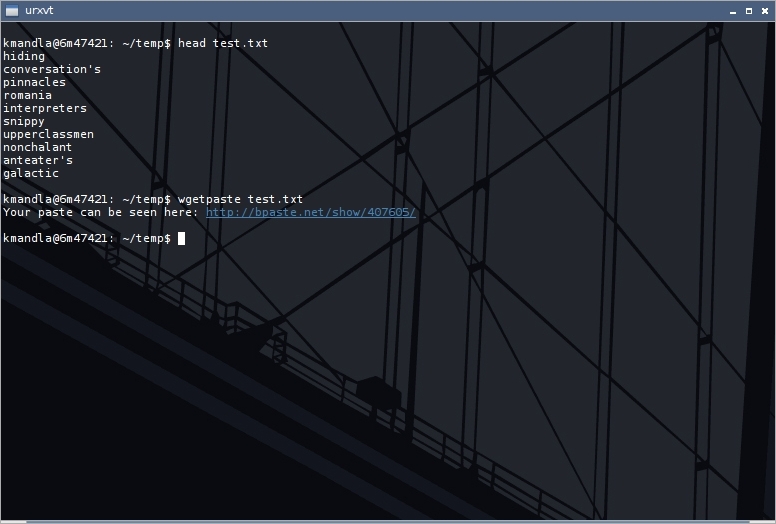 Terminal size clipped. No automatic conversion to gifs. Overall: This is step up from ttyrec, but it still seems to suffer the two main faults of its predecessor: I’ve seen a lot of corrupted playback, especially with full-screen console applications. And clipping the available recording area makes it only marginally useful to me. Pros: One tool for the entire process — record, save, and convert. Control over filenames in both the saving and conversion process. Can replay its own binary save files. Automatic conversion to gif, if desired. Cons: Sometimes tricky to play back a file without overwriting it. Relies on imagemagick. No automatic compression. No control over image format, or flags passed to imagemagick. Can eat memory like a pig — I’ve seen it gobble a gigabyte for a 20-second 80×24 recording. Sometimes corrupts the output image, but only very rarely. Overall: This is the one I use, mostly because it will record the entire terminal area, and generally it doesn’t garble the end result. I have accidentally overwritten a recording while trying to play it back, but the conversion to gif is convenient and thus far without fault (the one time it did create gobbledygook was probably my error). With a few small improvements, this could be the clear winner. If it doesn’t get a handle on memory consumption, it’s not going anywhere though. The gifs you’ve seen over the past week or so were made with tty2gif, and I’ve more or less implanted it into my system after tinkering with the other four. It’s possible that there are others, but between script and these others, you should be able to find one you prefer. termcast lets you broadcast terminal sessions live, a la twitch.tv or some other streaming video sites. I can’t say that I built up an entire system to show my own terminal sessions — the tools are there for that — but I did watch a game or two of nethack that someone else was playing. termcast relies on ttyrec for broadcast, but you can watch a game with only telnet. I’m not sure if the same issues with corruption or terminal size persist through termcast. I know I did see some garble in the games I watched, but I assumed that was from differences in terminal environments or something related to telnet. I got a link a long time ago to showterm.io but forgot what the name was, making it rather tricky to hunt down. James T. sent me a working link a few weeks ago, so I’ll credit him with the catch. The showterm client installs through gem or by straightaway downloading the binary from the home page. Recording and uploading a session provides you with a link, which you can use to view the session or share with others. If I remember correctly, I was able to upload a recording from an X-less machine, but it probably goes without saying that you’ll need some sort of graphical environment to view the link. I tried this quite a while ago, but I seem to remember elinks throwing its hands up in frustration when I fed it the showterm.io page. This entry was posted in Linux and tagged console, convert, emulator, image, record, terminal, tty, upload on 2014/06/07 by K.Mandla. My experiences with the *BSDs is extremely limited, but I am taking it on faith and on the advice of Wikipedia that tnftp is the default ftp agent in NetBSD, FreeBSD, OpenBSD and some others. If that is the case though, I can only hope that *BSD users have better luck that I do with it. It seems that regardless of the host, nothing seems to connect. If I use the traditional ftp available through Arch’s inetutils, I have no problems. An added irony, as you can see in the screenshot, is that tnftp is finding the correct IP address, but still insists it can’t connect. Perhaps I should be supplying a user name or a specific port, but it seems every variation ends up the same. It’s a little disappointing, but as I always do, I first assume the problem is mine. No doubt I am missing a step somewhere, or have misconfigured something. And I have no reason to assume that tnftp doesn’t work at all. It seems foolish to think that some of the most bulletproof software available on the planet would rely on a less-than-functional ftp client. Add to that it’s in both community and Debian. and Midnight Commander, if you’re willing to acknowledge its ability to open ftp addresses like normal, everyday folders. Plus anything that happens to crop up between here and the last of the Z section. This entry was posted in Linux and tagged client, download, file, ftp, manager, upload on 2014/06/03 by K.Mandla.